Okay, I know this is a bit late but no one ever wants to be the first to arrive at a party right??? I was away for the holidays vacationing in L.A. and I haven't stopped since I got off the plane. These are my excuses and I'm sticking to them! So now that I'm off, I finally have some time to reflect on what I want to "TRY" to achieve this year. Here are my seven deadly resolutions: (in no particular order). 2. Use up personal cosmetic products before purchasing new ones (i.e. Foundation, mascaras(failed), face moisturizers, eye creams, etc). 3.Try (and I mean TRY) to curb how much I spend on makeup. 4. Maybe start a youtube channel??? Some friends and family (especially my sister, who has me doing makeup tutorials via skype whenever she needs help putting a look together for some event) have suggested that I take the next step and get on youtube. 5. Start Jujitsu. I Train in kick boxing and I've been wanting to start Jujitsu for some time now. 7. Travel! I love to travel and I've been lucky to be able to visit many countries and live in some of them too :) For some time now, I've been waiting to visit Russia, Germany, Hungary, Romania, Croatia, Latvia, Estonia, Lithuania. Basically, with the exception of Germany and Croatia, all of Eastern Europe and the Baltic states. So there you have it, my seven "deadly" (well they could be the death of me) resolutions for 2012. 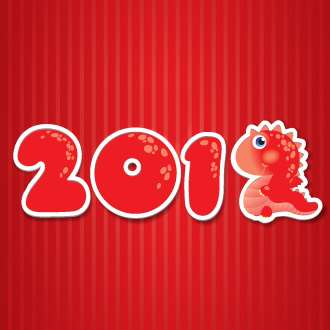 I'd love to know your resolutions for 2012. First of all... LOVE THE IMAGES!!! so cute! I would be your first subscriber if you ever started a youtube channel! Happy new year! Resolutions # 2 and # 3 are good ones! Also, you should read "The Confessions of Max Tivoli"...it's a great book! If only using up my makeup was my only problem, I just can't stop purchasing makeup!! Someone please hit me with a stone!!! Makeup is very hard to finish but you can't fight of the need to possess them all!